With a low back that extends beyond her plunging V neckline, RIVA frames shoulders in molten silver beading that captures the light and dances upon exposed skin. RIVA is luxury from head to toe with opulence being a constant element in every inch of her construction. 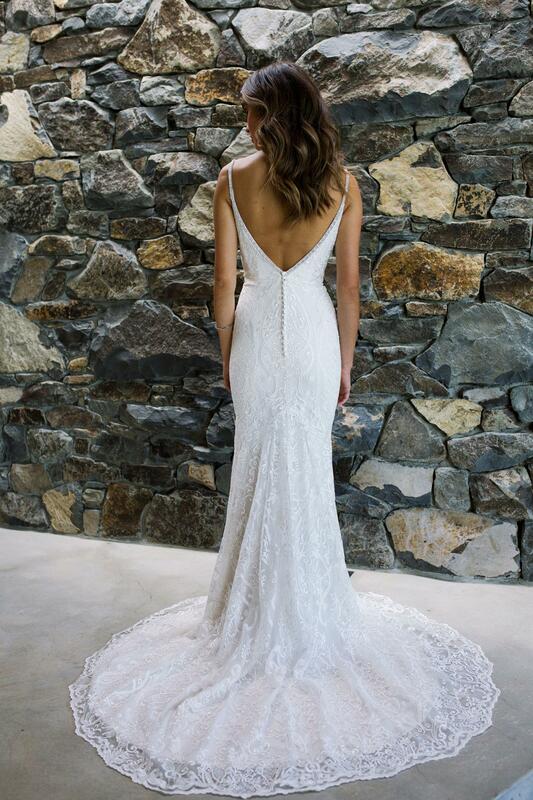 Lace scrollwork reinforces the optical illusion of her gently figure-hugging silhouette and ornately works its way down to the fully trimmed hem of the gown, leaving not a stitch untouched by its intricate beauty. With a train that ends just before her lace, her final impression is one of lightness and grace.